Again, a new history course! This time from another university – and what a difference. Not graffiti a la carte of 700 years, based on an expensive but erroneous and rich in imagery textbook. An internationally renowned lecturer started with great professionalism this course. Really I was impressed. Before I proceed, let me say something about the above mentioned textbook. It is completely unacceptable, that hundreds of students claim errors by thread: either typos or simple error of facts. That leads in my humbled opinion to the conclusion that assistants and students assembled this “study assistance”. And it has – again in my humble opinion – deliberate embezzlement by concealing historical evidence and biased information. Whoever doubts my cognition, please send me a message, which I will reply objectively. But something both courses have something in common: Chronometers. 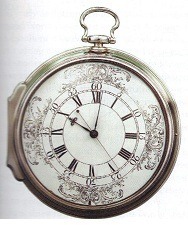 The first course has a beautiful image of a chronometer on its front page and mentions on page 553 of the textbook: ”in 1760s, the English clockmaker John Harrison perfected the chronometer, a timepiece mariners could use to reckon longitude while at sea. ..Harrison’s instrument made navigation so much safer and more predictable”. Also they were mentioned in the other course, explaining the importance of the longitude for navigation, referring to trade and its consequences. And without any doubt, the chronometer played a deceive roll in world history, therefore both professors are right, but for the wrong reasons. In 1761, when a carpenter by trade, John Harrison, presented his several times improved brainchild and claimed from the British Admiralty the 20,000 pounds sterling award for the solution of the longitude problem, thousands of ships safely have crossed the Atlantic Ocean since the discovery of America; or sailed to East Asia and Australia – all without a Chronometer. Sailors, like Bedouins in the desert, develop a certain sense during their years of experience at sea to find the way. And the Astrolab and logging, or “dead reckoning” as the sailor says, was sufficient for a merchant voyage, which always had its risks. So remains the question why the British Admiralty and not the British East India Company offered a 20 000 pound sterling award? Since the solution of the “geographical positioning problem” entitled the British Admiralty to use their fleet strategically worldwide. The chronometer made maritime planning possible: the arrangement of ships in a certain position in a certain time. This was wisely recognized and finally led to “Britannia rule the waves”.